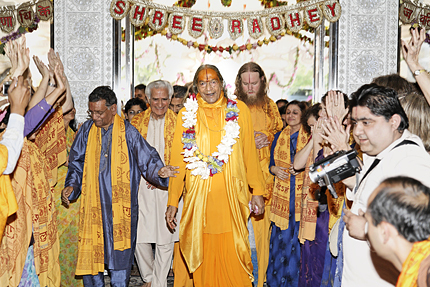 Kripalu Maharaj has said that the desired goal of a soul is to receive the selfless Divine love of Radha Krishn. Purification of the heart opens up room for bhakti and divine love consciousness. In this way we learn that Radha Krishn is the Soul of our soul. Knowing this, one must cultivate a deep desire for Their vision and love by strengthening faith in Them. Chant Their name and leelas, remove yourself from bad association, and nurture your desire for Them. Remember that They are truly yours and that you belong only to Them. They are most kind and merciful. Rest assured that all else outside of your desire and your devotion is in Their hands. And when we finally gain the deep knowledge of our separation from Krishna, we then cry: ‘Ha Krishn!’ ‘Ha Krishn!’ in our love-stricken grief. And with our desire to become truly whole again, we will embrace the belief that one day Krishn will surely come to us and make us His own, forever. O my Krishn! I desire to see the day when my eyes will be constantly flooded with the tears of Your love. O my Krishn! When will I wander the paths of Gahvarban singing: ‘Radhey, Radhey, Radhey’? When will that day come when I will be tipsy with love for You and thrilled with affection? O my Krishn! One day I will lose my body consciousness, and You will surely make me your own. This understanding of the fundamental significance of human desire is what dictates the Supremacy of Shree Maharajji's descension.